Whisper Key Set-Up - Any explanation in normal English? I'm trying to work through the set-up process for KS Multi-player, and I'm having trouble working out how to set-up Whisper Keys. I've watched several video guides and read everything on this and other forums, but so far I'm not convinced I know how to do it. You have to set-up a new channel for every person or group you want to whisper. You then create a Whisper List which assigns a whisper key to each channel. Once you have successfully done that pressing the whisper key will mute all by the specified channels. The problem is that I can't see how that would work in practice. For example if everyone is in the Allied Channel, and I want to talk to Wellington privately, how would pressing a whisper key that limits conversation to a sub-channel work unless Wellington was in it, and how would he know to be in it when I wanted to talk to him. It seems illogical, why bother with the whisper key if Wellington and I have to switch channel anyway. As an aside I've tried recording my voice on the channel and playing it back, but all I'm getting is silence so not sure if its working anyway. Although my headset works fine with Mumble. Re: Whisper Key Set-Up - Any explanation in normal English? I never use whisper keys. I find that if I'm close to another player a short exchange of point-blank courier messages is perfectly adequate. We could probably do with just removing the whisper key info from the set-up advice post... Kevin? In a way its helpful to have a new person come along and try to follow our instructions. All the usual crowd haven't looked at them in years probably and we have no idea what is now redundant! Actually I think I've worked it out, though thinking back to the video's and things I sat through explaining it I still haven't clue what they were talking about. So, this is how I think it works. On the TS Client screen open the Tools Menu and select Whisper List. To create a new Whisper Group click on 'New' and you will be prompted to Press a Hot-Key combination. 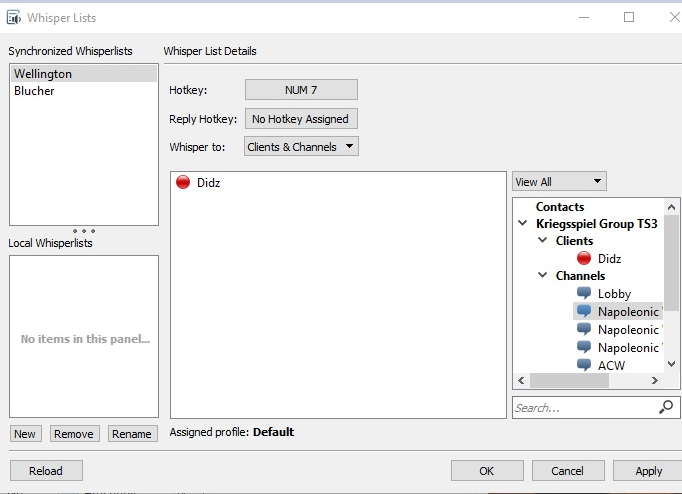 Finally you have to drag and drop the Contacts you want included in each group from the Contacts List on the right into the Whisper List Group Panel in the centre. If it works how I think it works, Pressing the Whisper Group Hot-Key mutes everyone on the server, except the people listed in the Whisper Group.